Scrap Dental Gold – When Can I Sell It Without Risk of Being Ripped? With the high market price of gold right now, you may be considering selling any scrap dental gold that you may have or your teeth and crowns, literally. But when is the best time to sell this metal without getting ripped off on the price? This will depend on several different factors. One is the current spot price of precious metals on a given day. If the current value of them is high, the time is right. If it’s low, than what this precious metal cost you in the past then you may want to wait until the prices go higher to sell it off. Otherwise you may end up taking a loss, because the current scrap gold value is less than what you had paid for it. However, it may be hard for you to know the actual value of the metal you paid for because the total price for dental pieces is comprised of so many variables going beyond the actual price of the precious metal like dentists’ labor, office fees and else. If you have scrap dental gold that cost less than the current price set by the market, you may want to sell. Doing your homework and understanding the true value of the gold scrap recovery product can help you avoid being scammed by an unethical dealer, who is trying to pay much less for your scrap dental gold than what the actual value is. Dealers who are buying scrap precious metals for extremely low prices usually do not stay in business long, and avoiding these scammers will help you get the best possible price for your prized possessions. 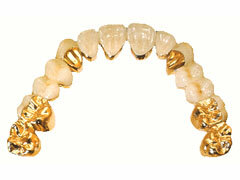 Selling scrap dental gold without taking a loss is possible, as long as you value the gold accurately. With the demand for gold commodity, because of the global economic uncertainty and the devaluation of many currencies around the world, there are numerous buyers out there. Some of these buyers offer fair prices, while others are out to make a huge profit at your expense. Know the karat purity of your dental pieces, as well as the total weight. This will let you determine their value, so you can refuse any offers that are ridiculously low. You can turn in your possessions to a trusted jeweler, coins shop owner of a precious metals refinery. Ask for a free estimate and shop around to get several estimates to compare. An honest refiner should offer to pay you at least 85% of the total pure value of the precious metals that your scrap contains.